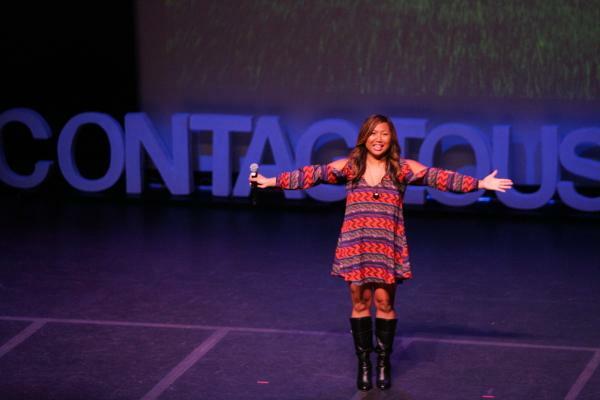 What a blast & an honor to be included in a line-up of world-class speakers & music artists at the Oct 11th 2014 Contagious Optimism Live event at the Thousand Oaks Civic Arts Plaza! It was my first time delivering a 10min power talk including song & fun interactive moments for the audience. I had been prepping for weeks amidst my travel & other adventures...and wow did it pay off! I felt excited and grounded at the same time - it was such a sweet feeling. So this was certainly a personal aha on the value of putting in prep time which allowed me to just be in the moment, to enjoy it all & not worry about my presentation. The best compiment I got was from one of the speakers who said how present & grounded I was during our conversation just minutes before my presentation. That's the best - do my thang & really be there in the moment to soak it all in! As we started the program w/ the amazing Lynne Rose & the already hyped-up audience, I wondered where we could go for the rest of the day. Everyone was already so high, so uplifted, but boy was I surprised. I didn't know that even on this topic of optimism & being positive, that there is such depth & expansiveness to it. There were laughs, profound moments of insight, sheer fun, happy smiles, loud "oh yeahs," teary ahas & so much more. I thought "being happy" was this stagnant place or that it had a ceiling. Of course I was wrong...thank God!!! "If you love yourself and embrace your dreams, flaws & all, your life will have no choice but reciprocate." "Limitations are not stop signs. They're arrows that point people in different directions."